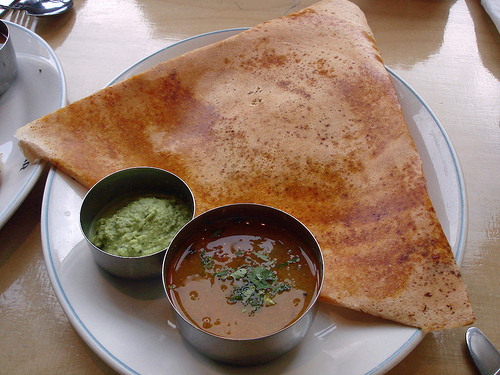 Though dosa typically refers to the version made with rice and lentils, many other versions of dosa exist and are popular in varying degrees. This is sometimes specific to a region in India. * 1/4 cup white urad dal. Chop potatoes coarsely. Chop green chillies. Heat oil, add cashews and brown lightly. Add dal, seeds and splutter. Add chillies and onions. Fry till tender. Add turmeric, salt,potatoes, coriander. Mix well. Add soda bicarb and salt and mix well. Keep aside in a warm place for 8-10 hours.Beat the curds well. Add to the batter, add more water if required. The consistency of the batter should be enough to thickly coat on a spoon when dipped. Heat the iron griddle or non-stick tawa well. Pour a spoonful of batter in the centre, spread with the back of the spoon to a thin round. Pour a tsp. of ghee or oil over it. Spread chutney spread over dosa. Place a tbsp. masala in the centre. Fold into triangle to cover masala. Remove with spatula when crisp. Serve hot with chutney and/or sambar. This entry was posted in South Indian Recipes. Bookmark the permalink.